A new study shows that mutations in SCN9A, the gene encoding the voltage-gated sodium channel Nav1.7, lie behind some cases of idiopathic small fiber neuropathy (I-SFN), a relatively common pain condition that develops in adulthood. Ingemar Merkies and Catharina Faber, University Medical Center, Maastricht, The Netherlands, found that among 28 patients with I-SFN, one-third had mutations in SCN9A. Functional analyses of the mutant channels, in collaboration with Stephen Waxman, Yale University School of Medicine, New Haven, and the Veterans Affairs Medical Center, West Haven, Connecticut, showed that the mutations activate the channel and render dorsal root ganglion (DRG) neurons hyperexcitable, offering an explanation for the profound pain and nerve degeneration that patients experience. The results were published in preliminary form online in the Annals of Neurology on May 20, and in final form June 22. Millions of people worldwide have small fiber neuropathy. For roughly half of them, no cause can be found, and often there is no effective treatment. This study suggests a possible basis for a considerable portion of these idiopathic cases, and points the way to new therapies. Importantly, the study marks the first time that SCN9A has been implicated in a common pain condition and in axon degeneration. Previously, the gene has been known to cause rare hereditary pain conditions. Gain-of-function mutations cause the aberrant pain of erythromelalgia (EM; Yang et al., 2004; Cummins et al., 2004) and paroxysmal extreme pain disorder (PEPD; Fertleman et al., 2006). Loss-of-function mutations, on the other hand, cause congenital insensitivity to pain (CIP) (first reported in Cox et al., 2006). In addition, a common single nucleotide polymorphism (SNP) that changes channel function (Estacion et al., 2009) has been associated with altered pain perception in the general population (Reimann et al., 2010). Nav1.7 is preferentially expressed in the small diameter peripheral axons of DRG sensory neurons that are affected in I-SFN. Theorizing that SCN9A might be involved in the disease, first authors Faber and Janneke Hoeijmakers examined the gene in 28 carefully chosen Dutch subjects. A clinically diverse diagnosis, I-SFN involves pain that begins in adulthood and usually starts in the feet and hands, is accompanied by degeneration of small nerve fibers and autonomic dysfunction, and has no discernable cause. The study patients all had documented abnormalities of small fiber function as measured by quantitative sensory testing (QST) and showed reduced nerve fiber density in skin biopsies. Eight of the 28 turned out to have mutations in SCN9A, all of which were novel missense mutations that resulted in single amino acid changes in Nav1.7. None of the mutations was found in a group of 100 healthy control subjects. Those changes in channel function spelled trouble for the neurons. All of them rendered DRG neurons grossly hyperexcitable by making the neurons spontaneously active and by increasing the frequency of stimulus-dependent firing, Waxman’s group showed. The researchers believe that in vivo, the increased firing of the neurons produces the spontaneous pain that patients experience. But even more, they suspect that increased passage of sodium into the cells leads to degeneration of axons in the skin, a hypothesis that Faber and Waxman say they are now investigating. A similar mechanism has been shown to occur in diseases of the central nervous system such as multiple sclerosis (Stys et al., 1991; Garthwaite et al., 2002). The results may help researchers eventually understand the diverse presentations of I-SFN. Even among the eight patients with SCN9A mutations, the patterns of pain vary. For example, Waxman says that the team is now looking more closely at the mutant channels from one patient whose symptoms began with severe jaw pain. They are expressing that patient’s mutant channel in trigeminal neurons, which innervate the jaw, to see whether it has a particularly large effect in those cells. For Faber, one of the most important outcomes of this study is that it puts a definition on a formerly nebulous disease. “A lot of patients with small fiber neuropathy were sent to psychiatrists, or sent home, and told, ‘You have pain, but we don’t see anything, so there’s nothing wrong with you,’” Faber said. Today, skin biopsies can help to reveal the problem, but even so, Faber said she sees patients who have gone for many years without a diagnosis. The new findings offer “a recognition that they have a real disease, and that there is something causing the disease,” she said. For more news on Nav1.7 mutations, see News Brief: Get a Whiff of This—Mutations in SCN9A Linked to Anosmia. For a Q&A with Stephen Waxman about sodium channels, see A New Chapter for Sodium Channels. 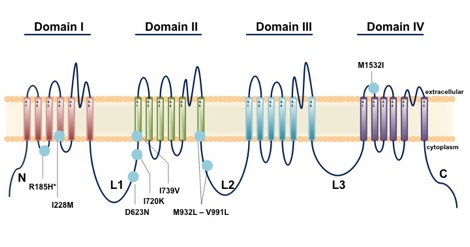 Gain of function Na(V) 1.7 mutations in idiopathic small fiber neuropathy. Ann Neurol. 2012 Jan; 71(1):26-39. Epub 2011 Jun 22. This is a really useful clinical paper! A clinical group which presents difficulty for diagnosis and treatment is carefully dissected, namely 248 Caucasians with a phenotype diagnosis of small fiber neuropathy. In this group, after careful elimination of other diagnosable conditions, eight of 28 were found to have a heterozygous SCN9A mutation. The SCN9A mutations found were carefully examined by detailed electrophysiology—a very expert procedure, but absolutely necessary in this context. Interestingly, the SCN9A-mutation subjects could not be discriminated from those without an SCN9A mutation, and the patients usually had autonomic features. Of note, this project did not seek or use a family history as a discriminator, nor carry out family studies of phenotype or genotype. But this is not a criticism of the work, as it more closely reflects normal clinical practice. The conclusions of this work are of use: that a significant proportion of individuals with small fiber neuropathies will have germline pathogenic activating SCN9A mutations; that family studies may be indicated for diagnosed individuals to ensure diagnosis and therapy; that SCN9A activating mutations can cause a small fiber neuropathy (and may be more likely to do so as a person ages); that the consequences of SCN9A mutations on human pain phenotypes are not yet completely understood or defined (maybe a predominantly autonomic phenotype awaits description? ); and finally, as the authors point out, that these patients with pain due to SCN9A mutations need to be identified, as the soon-to-be-available SCN9A antagonists may be their only hope for pain relief. These findings remind us that a substantial portion of unexplained chronic pain is neurological, and neurologists need to look beyond diseases of myelinated axons to consider small fibers and their dysfunction. Small fiber polyneuropathy is relatively common, and most cases are labeled idiopathic, having no known cause. This study reports that a substantial minority of Dutch SFPN patients has gain-of-function mutations in a sodium channel enriched in small-fibers. The mutated channels cause hyperexcitablity of neurons, which appears to explain these patients’ chronic pain and dysautonomia and possibly the axon degeneration that is detected by skin-biopsy. The work opens up the possibility of testing for mutations, and questions of family planning will come with that. Also, the results suggest that sodium-channel blockers could be used more for treating SFPN and other neuropathic pain. Mexiletine and continuous subcutaneous lidocaine, as well as carbamazepine should be considered as alternatives to chronic opioids.